I wouldn’t normally post book reviews, but this one affected me quite a lot, and plus, I know the author and want to help get the word out about her book. I met Dawn Barker in 2010 when we participated in the Hachette/Queensland Writers’ Centre Manuscript Development Program, and it was there that I heard her read an excerpt of her then-unpublished manuscript. We’ve kept in contact since through numerous games of Words With Friends and conversations about our writing pursuits, and it’s been fascinating for me to follow Dawn’s journey as that manuscript was taken from its first beginnings to a polished novel. Fractured tells the story of Anna and Tony in the early days after having their first baby. As the title suggests, things don’t go as smoothly as they expect. From the first page of this book, the reader knows that something is very wrong. Fractured is structured around a terrible tragedy that is central to the story, and flips back and forth between the days and weeks that precede the event and the consequences that follow, each chapter leading the reader ever closer to the events of ‘that day’. The story is told from the perspectives of Anna and Tony as well as both of their mothers as each deals with the tragedy in their own way. 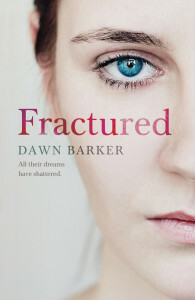 Fractured is an unsettling, chilling tale of postnatal depression and psychosis that brings a topic that has long been taboo into our lounge rooms and our consciousness. Mental illness is no longer an affliction that is hidden away, but postnatal depression, which affects a shocking one in seven mothers in Australia, is still rarely spoken of outside of a few token paragraphs in parenting books and websites. Dawn draws on her experience both as a child and adolescent psychiatrist and as a mother of three young children to tell this story. Reading about Anna’s experiences in those first shaky, isolating and stressful weeks of motherhood was so eerily familiar, it was almost as if the writer had been in my head when I had my baby. If I had any criticism about this book, it would be that there wasn’t much exploration of Anna’s transition from these ‘normal’ feelings through to postnatal depression and then psychosis. But then, this may also be a deliberate device as Anna increasingly loses touch with perspective and reality. Fractured is not a cheery story. If you like happy-ever-after endings, this is not the book for you. It’s a difficult book to read, particularly if you’re a parent. I felt as if I was holding my breath for half of it and crying for the other half. Nevertheless, I think it’s an important book for raising awareness about mental illness and hopefully removing, or at least easing, the stigma of postnatal depression for those who suffer it. When someone you know becomes a new mother, don’t just offer to bring her food or do the dishes*. Ask her if she’s OK. Ask her how she’s really feeling and encourage her to talk about it. You never know whether you might be opening the door to healing or, perhaps, helping to prevent something terrible from happening. *Still offer these things. She will love you for it.